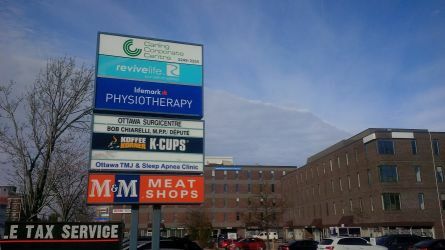 We are located in Ottawa West, near the Carling and Woodroffe intersection. There is free parking, including accessible spots conveniently located directly in front of the clinic. 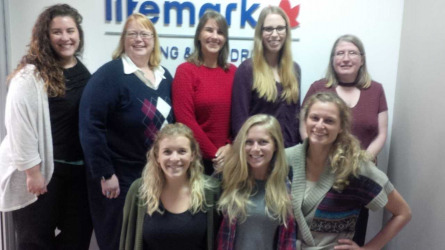 Lifemark Physiotherapy Carling & Woodroffe in Ottawa offers comprehensive rehabilitation services including physiotherapy, occupational therapy, massage services, speech language pathology and psychotherapy services to aid in the recovery of multiple conditions. 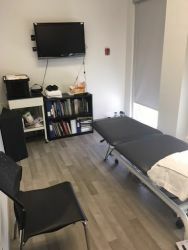 Our dedicated and experienced clinical staff includes four physiotherapists, seven occupational therapists, two massage therapists, a speech language pathologist, a psychotherapist, a kinesiologist, a pedorthist and an occupational therapy aid. 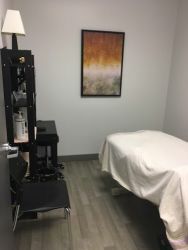 Our therapists have special interests and training in sport injuries, orthopaedic injuries, vestibular disorders (dizziness and balance/vertigo), men and women's pelvic health issues, manual therapy and concussion rehabilitation. We provide treatments for a wide array of conditions including workplace injuries, motor vehicle accident injuries, sports injuries and everyday aches and pains. We also deliver specialized rehabilitation programs for clients requiring extensive multidisciplinary treatments generally funded by insurers. 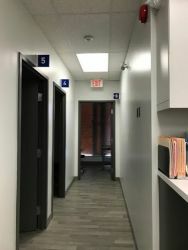 We offer a clean, bright and comfortable setting for our patients. 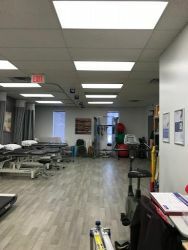 We have a bright spacious 2580 square foot clinic, recently renovated space with a large gym area and seven private physiotherapy and rehab treatment rooms, including dedicated massage therapy and vestibular treatment rooms. 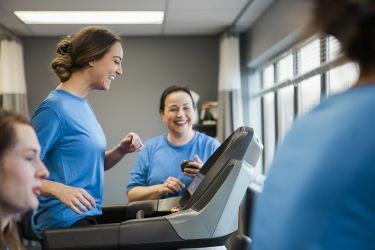 Our equipment includes a stationary bike, a treadmill, a Precor FTS Glide resistance apparatus, a full selection of dumbbell weights and resistive therabands, proprioceptive and stability training equipment (profitter, Airex mat, Bosu, Swiss ball, foam rolls), a traction table, infrared goggles and a work simulation station. Arthritis is the classifcation of approximately 200 rheumatic diseases and conditions that affect joints, the tissues that surround the joint, and other connective tissue, causing pain, stiffness and mobility challenges. Assessment and treatment from a physiotherapist and chiropractor may help relieve the pain and stiffness. Carpal tunnel syndrome is caused by pressure on the median nerve in the wrist and can result in numbness, tingling and pain in the affected hand and arm. It is often the result of repetitive use and strain. Physiotherapy can help alleviate some of the symptoms associated with carpal tunnel syndrome. Frozen shoulder is a progressive condition that often starts with pain in the shoulder joint during basic movement. If the condition is left untreated, pain increases and mobility decreases. Physiotherapists can assess and develop a treatment plan. Hand, fingers and wrist pain can include symptoms such as tingling, numbness and weakness. The most frequent causes are carpal tunnel syndrome, injury or overuse. An assessment and treatment protocol by a physiotherapist can help. Headaches can be caused by a variety of conditions and once assessed by a healthcare professional can be helped with physiotherapy treatment. A herniated disc refers to a problem with one of the rubbery cushions (disks) between the individual bones (vertebrae) that stack up to make your spine. Chiropractic services can help with the associated pain and discomfort. Knee pain can be caused by bursitis, a torn tendon, ACL tear or injury and overuse. It is most frequently the result of osteoarthritis. Physiotherapy can help speed recovery. Low back pain is one of the most common patient complaints. It can result from arthritis, spinal stenosis, scoliosis, sciatica, injury or overuse. An assessment from a physiotherapist or chiropractor can help provide a diagnosis and treatment plan. Muscles sprains and strains can result from sport or motor vehicle injuries, overuse or common activity. They can range to mild, moderate to severe requiring more intensive intervention. Physiotherapy and massage therapy can help speed recovery. Neck pain can result from poor posture, injury like whiplash, infection in the lymph nodes or throat, or a herniated disc. Physiotherapy, massage therapy or chiropractic treatment can help improve mobility and pain. Plantar fasciitis is one of the most common causes of heel pain. Plantar fasciitis commonly causes stabbing pain that usually occurs with the first steps in the morning. With more movement, the pain typically subsides, but can return after running or standing after sitting for a length of time. It most commonly affects runner and other athletes. An assessment from an orthotist/pedorthist may help with the symptoms and pain. Complications following surgery can include pain, limited mobility, numbness and emotional issues. An assessment from a qualified physiotherapy along with a detailed treatment plan can help to alleviate post-surgery challenges. Posture issues, or an excessively curved spine can result from hip, foot or neck/back joint issues, often from sitting improperly at work, standing for long periods, or common foot problems like fallen arches. Chiropractic services, or an assessment from an orthotist/pedorthist may help. The rotator cuff consists of four muscles that surround the shoulder blade (scapula), and help to hold the arm bone (humerus) in the shoulder capsule. 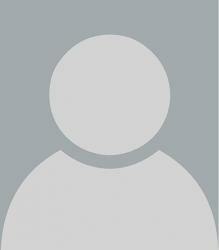 It is easily injured by sport, repetitive use and common daily activity. Physiotherapists can help diagnose and treat symptoms. Scoliosis is when an individual's spine has a curve to the side, usually described as 'S' or 'C' shaped. Scoliosis can cause pain, digestive issues and mobility challenges. Chiropractic services can help mitigate the symptoms associated with scoliosis. Temporomandibular joint dysfunction or TMJ refers to pain and dysfunction of jaw muscles and the joints that connect the jaw bone to the skull. It is characterized by pain, difficulty chewing and noises (popping/cracking) when the jaw moves. Physiotherapy or massage therapy may help alleviate some of the symptoms of pain and discomfort. Our clinic staff can help confirm your health insurance coverage. Your treatment may be partially or fully covered if you have extended health benefits, a worker’s compensation claim, or were injured in a motor vehicle accident. Please check your coverage in your company’s extended health plan. Please note that for payment, all major credit cards, debit, cash and personal cheques are accepted.